Even though matcha is nothing new, the finely ground green tea powder is having a resurgence in popularity in L.A. Over the last year, two matcha-dedicated cafes have opened up in town: Matcha Box in Beverly Grove and Shuhari Matcha Cafe in Venice. The craze has even extended to boozy variations of the earthy, jade-tinged tea as well. From matcha-laced gin fizzes, to Moscow mules and martinis, here are some bars and restaurants serving up their spins on the classics. Over at Big Bar by Alcove, you can get a creamy and refreshing Matcha Kit Kat Fizz that&apos;s actually garnished with the Japanese chocolate treat. It&apos;s head bartender Cari Hah&apos;s favorite Kit Kat flavor, and as a love letter to the sweet, she wanted to create a drink that tasted exactly like it. This one is a play on the fizz, made with Aviation gin, Luxardo Angioletto (a hazelnut liqueur), house-made vanilla bean syrup and matcha powder. Hah suggests guests take a sip of the cocktail first and then a bite of the chocolate to get the most out of the drink. And you&apos;ll get to enjoy the Matcha Kit Kat Fizz until at least November, that&apos;s when Hah is hoping to launch her next menu. "I always want to have a fizz on the menu because fizzes are such a labor of love and a test of skill to make a really good one," Hah says. "I know that so many bartenders get annoyed when people order fizz drinks because it does take a long time to make and it&apos;s a bit involved, but I train my bartenders to love making them, and they all have gotten so great at it!" Big Bar by Alcove is located at 1927 Hillhurst Ave., Los Feliz, (323) 644-0100. $14. E.P. has a citrus-y, matcha-filled cocktail on their hands: the Macho Matcha Man. (Try saying that three times fast.) 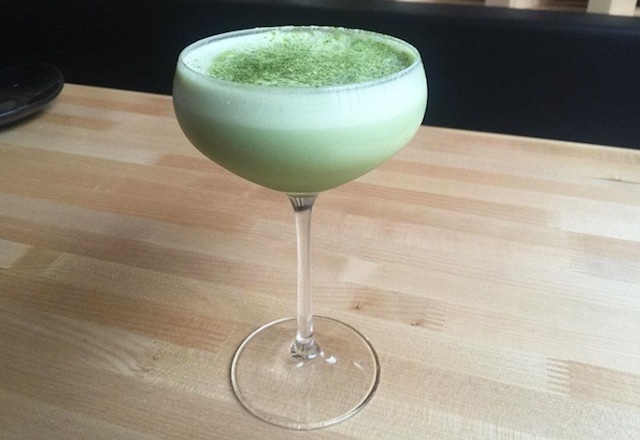 Head bartender Adam Nystrom&apos;s creation is made with shochu, matcha, Asian pear, lemon and egg white. He says this cocktail, which is available through the fall season, pairs best with E.P.&apos;s lighter dishes, like sashimi. Nystrom has also made sure to keep the Japanese theme to his libation. "All of the ingredients are either Japanese, traditionally Japanese or originated in Japan," he says. 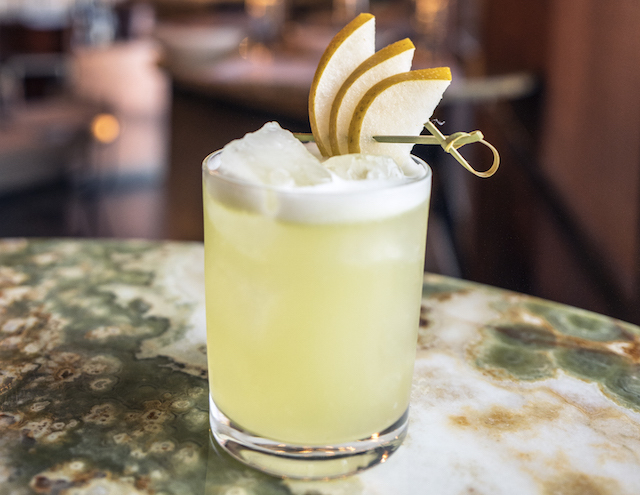 "We start with a dry, barley-heavy blend of Japanese shochu from Nadeshiko called &apos;True Beauty.&apos; It has a low ABV (50 proof) and has a dry, earthy quality that pairs nicely with the Asian pear. The matcha tea adds an intensely herbal, green element that really brings it all together. Then we just balance it out with a little lemon and egg whites. Served as a sour on the rocks, it&apos;s both juicy and dry at the same time with just enough alcohol to carry the flavors." E.P. & L.P. is located at 603 N. La Cienega Blvd., West Hollywood, (310) 855-9955. $13. You can enjoy the waning days of summer with Chaya Downtown&apos;s off-menu matcha punch, which you can only order until the end of this season. This one is a concoction of house-made matcha-ginger syrup and a serious lineup of spirits, including vodka, tequila, gin and rum, with ginger beer floated on top. 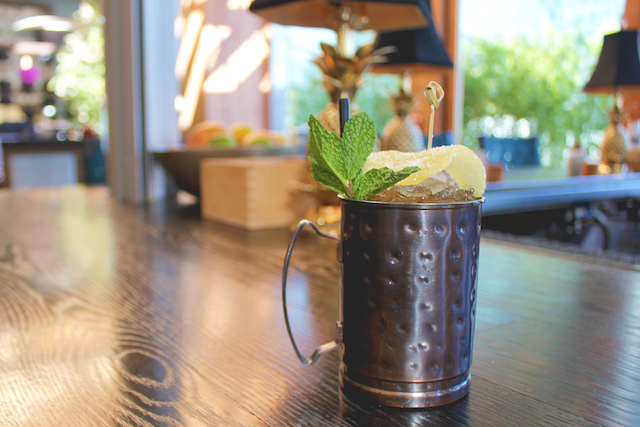 Bartender Marco Carrasco&apos;s syrup is a special one. "I blend the ginger and then put it on a cheese cloth to squeeze out the juices," he says. "I then add the juices to a pan with sugar and matcha powder to make the syrup. This drink is an Asian twist on a Long Island Iced Tea. Adding ginger beer at the end gives it a nice kick." Chaya Downtown is located at 525 S Flower St., downtown L.A., (213) 236-9577. $14. This trendy sushi and teppanyaki restaurant has a play on the Moscow mule, with the aptly named, Matcha Mule, something that is a staple on the menu. Mixologist Charity Johnston likes to design all the cocktails at ROKU to have a Japanese flair, which was the impetus for centering a drink around matcha green tea. While she didn&apos;t originally plan on turning this cocktail into a Moscow mule, it "kind of transformed into that in a way," she says. 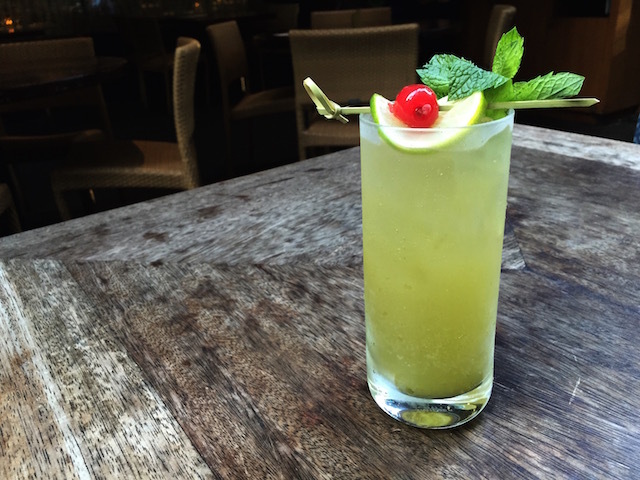 This boozy beverage is made with green-tea-infused vodka, ginger root, lemon and honey. "I didn&apos;t want [the matcha] to be overstated so I thought infusing the vodka with green tea would just give it the hint that it needed. I tried it out and it balanced perfectly. [You get] a little spice, soothing honey and lemon, with a little green tea at the end of each taste." ROKU is located at 9201 Sunset Blvd, West Hollywood, (310) 278-2060. $15. For the month of August, Westbound&apos;s head bartender Dee Ann Quinones is offering her spiked shakes that are made in collaboration with Van Leeuwen&apos;s ice cream flavors. Her creamy Matcha Madness consists of vegan matcha ice cream, Rittenhouse rye whiskey, honey syrup, Amaro Montenegro and matcha powder. The bartenders use an immersion blender to give it all a good shake. "I thought about it in the way you would approach tea or a matcha latte. When I decided to add honey and Montenegro to this shake, I decided to use rye to add an element of spice in this boozy shake," Quinones says. Westbound is located at 300 South Santa Fe Ave., downtown L.A., (213) 262-9291. $16. Besides the high-quality omakase dishes you can get at Hamasaku, they also offer a matcha-laced cocktail that&apos;s been a mainstay on their menu. 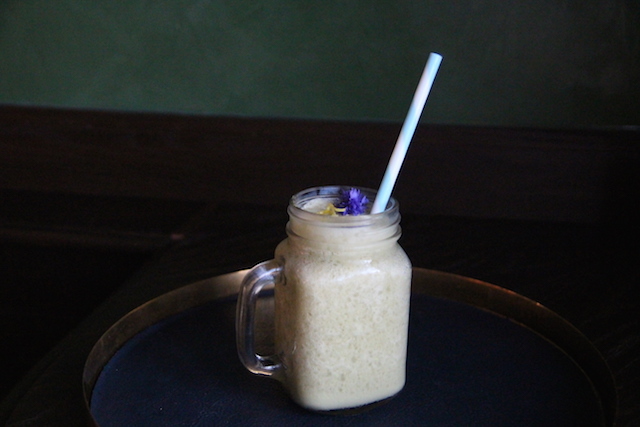 The Cha-Sen is a mixture of matcha powder, cream, egg white, lemon and oak barrel-aged shochu. The original version had rice shochu, but General Manager Jesse Duron replaced it with aged barley shochu to give it a smokiness to complement the earthiness from green tea. Hamasaku is located at 11043 Santa Monica Blvd., Westwood, (310) 479-7636. $10. New York&apos;s popular Blue Ribbon sushi restaurants spread its wings to the West Coast last year with their first California outpost at The Grove. Not only did Blue Ribbon bring along its famed wasabi-honey fried chicken across the country, its Matcha Tea Martini tagged along for the ride, too. 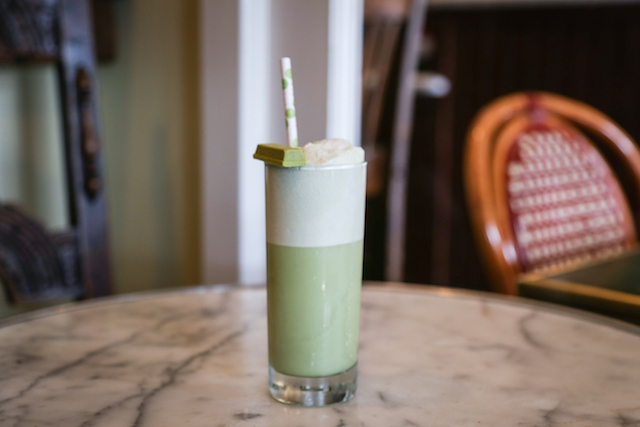 Frieda Hor, the creator of the libation and bartender at Blue Ribbon, says, "Matcha has a rich savory character with high, sweet notes that linger on the palate. Both aspects are held in place with a splash of dry vermouth in this twist of a classic. 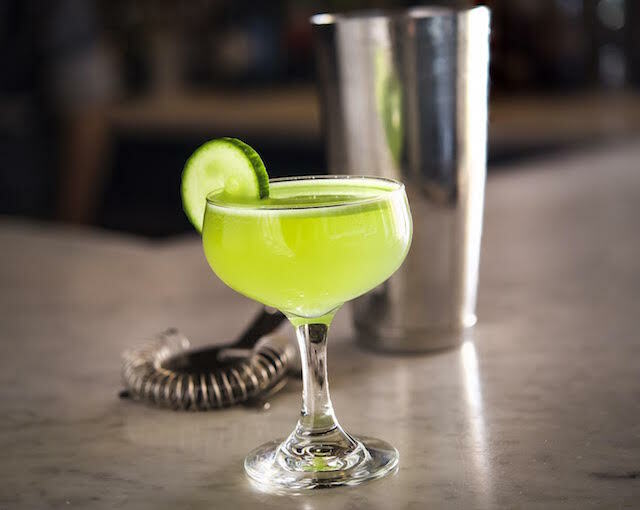 The vodka provides a clean base to showcase these flavors, and a house-made honey syrup rounds out the cocktail, making it an ideal pairing for the restaurant&apos;s superb seafood and sushi." Blue Ribbon Sushi Bar & Grill is located at the Grove at 189 the Grove Dr., Fairfax, (323) 352-9300. $13.